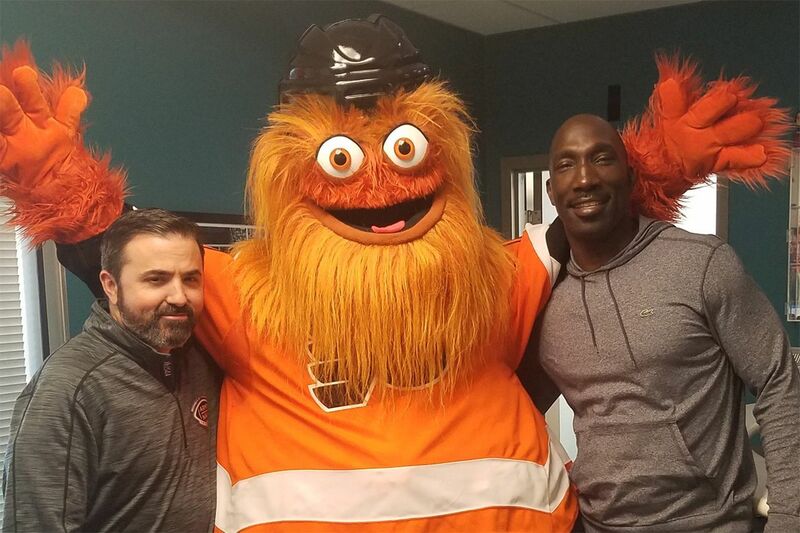 WIP afternoon hosts Jon Marks (left) and Ike Reese pose with Gritty at the station's Center City studio. In terms of ratings, 94.1 WIP’s Angelo Cataldi remains an unstoppable force on Philadelphia sports radio. But it’s two of Cataldi’s colleagues who had the best quarter. Jon Marks and former Eagles defender Ike Reese, WIP’s drive-time duo who have been paired up since November 2017 following Chris Carlin’s departure, ended the quarter in first place during drive time among male listeners between the ages of 25 to 54, according to Nielsen numbers obtained by the Inquirer. Charles Barkley destroyed the Sixers at halftime. Then they tied an NBA record. The winter book, with covers ratings from Jan. 3 through March 27, is one of four quarterly rating summaries used to determine bonuses, advertising rates, and bragging rights. All numbers reported in this story are for men 25 to 54, the most important listening demographic for both radio stations. Marks and Reese defeated 97.5 The Fanatic’s Mike Missanelli, who ended the quarter in fourth place, by less than a ratings share. It’s the second time Marks and Reese have topped Missanelli in a quarterly book (winter 2018 was the first). Carlin, who now co-hosts a show on sister station WFAN in New York City, congratulated the duo on the ratings win. Hey -- how bout @MarksReeseWIP finishing 1st in the ratings in Philly with a HUGE number? So happy for Jonny & Ike along with @bliv94 & @SpikeEskin. Awesome stuff! Congrats guys! Eric Johnson, the Fanatic’s program director, contested that conclusion, pointing out if you add in Nielsen streaming rating numbers from the same period, Missanelli actually tied with Marks and Reese. This was also the argument the last time Missanelli lost a quarterly book to Marks and Reese, and there are undoubtedly many listeners who happen to tune in digitally rather than listening on a radio. But Nielsen breaks out the two numbers separately for a reason, and stations rarely use them to sell ads online due to their volatility and web analytics that allow companies to track the exact numbers of their streaming audience. Many don’t even pay Nielsen to report streaming ratings. In the morning, Marc Farzetta and his new morning show on The Fanatic have a long way to go before presenting a serious challenge to Cataldi. The longtime WIP morning show host and his colleagues — Rhea Hughes and Al Morganti — finished the quarter in second place, handily defeating The Fanatic’s new show by more than four ratings points. But Farzetta and his team – which includes former Eagles offensive lineman Tra Thomas and ex-Daily News reporter Bob Cooney – grew their ratings slightly over last quarter, finishing in a respectable fourth place. In the afternoons, Joe DeCamara and former Eagles fullback Jon Ritchie put in yet another strong performance. The duo finishing the quarter in third place, nearly three full ratings points ahead of The Fanatic’s Anthony Gargano and Jason Myrtetus, who came in sixth place despite also growing their ratings slightly compared to last year.